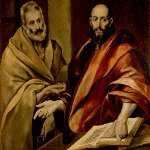 June 29 is the Feast of Saints Peter and Paul, that is observed by Western Christianity. The feast has got ancient origin and it had been established in Roman Empire. The feast is so old, that the origin of its celebration is forgotten. It is believed, that June 29 was chosen as the day for the feast to commemorate the death of the saints or the translation of their relics. Saint Peter is the patron saint of numerous European cities, including Rome. He is associated with founding of the Church of Antioch, one of five major churches that composed the Christian Church, thus he considered as the first pope. Saint Paul is considered as one of the most important figures of the Apostolic Age. He was the founder of several churches in Europe and used his status of a Jew and a Roman citizen to advantage in his ministry to both Roman and Jewish audiences. Some countries celebrate Feast of Saints Peter and Paul as a public holiday, for instance, in Malta, Chile, Peru, Italy, Colombia and some parts of Switzerland.